Just listed and ready to fish!!! This 9 foot beamed 20* deadrise hull takes water with the best of the out there. She is a BEAST!! Run with the big guns but at much greater speed and incredible efficiency. Powered by twin 2006 Yamaha 150 Four Strokes with under 600 hours this is a great fishing machine or day cruiser. Loaded and ready to go with T-Top, Full Electronics, GPS/Fishfinder, big bow flare for a dry ride in rough conditions. Newer Garmin echo map DV, also newer west marine vhf radio. Trailer is included in the price. 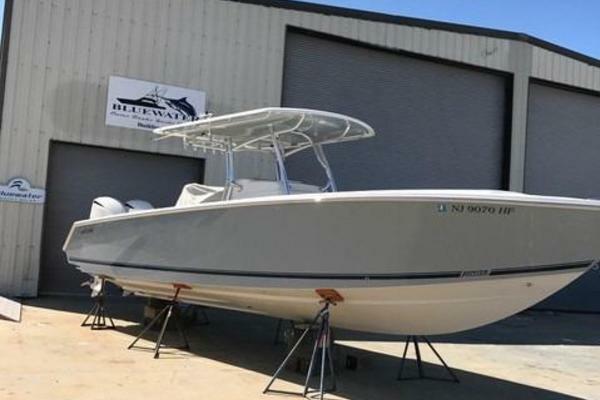 West Florida Yachts would love to guide you through a personal showing of this 27' Triton Center Console 2004. This yacht for sale is located in North Palm Beach, Florida and priced at $34,999. For a showing please contact us by filling out the form on this page and we will get back to you shortly!